I’ve updated so few times over past months that I have trouble sitting down and deciding what to share and what can be left out. However, I often find that if I get started then things just come as they need to, and the think I’m thinking about is… ducks. Yes, let’s try from there. Back in the spring we were extremely excited to find one of our ducks sitting on a nest. We were delighted and had been wanting the flock to grow. The clutch of eggs she was managing was extremely large, and we wondered if the other hens were adding eggs to it. But, we decided to go for a very hands-off approach and trust that she knew what she was doing. In retrospect, I don’t exactly think we were wrong to do that, but I don’t know that we did all things right, either. A month went by, and she diligently sat on those eggs. Then, around the time they were set to hatch, she stopped. I didn’t know what to do. I waited. After a few days we were fairly certain she’d given up. Cold dead eggs. I even saw a couple of fully formed ducklings in the clean-up process, their perfectly formed little bodies just nestled within the shell. 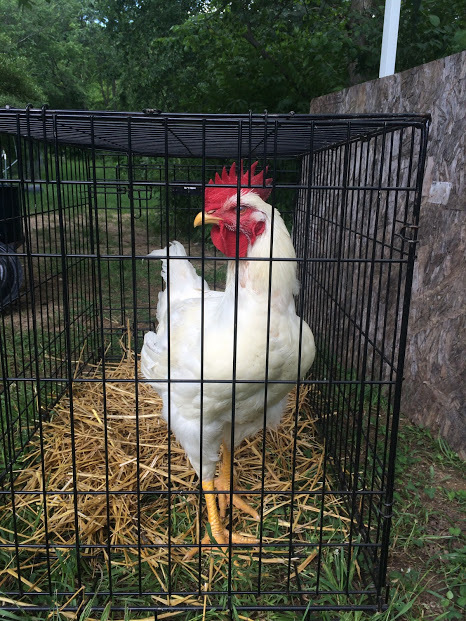 This was “Little John”, our one white meat bird- probably a mix up from the hatchery. After that, it was time to butcher our chickens that we’d raised for meat. Jeff and I dedicated several hours over a week at the end of June to do it. 28 birds in all. The taking of animal life continues to be a teacher to me. It’s become more familiar to me and we’ve gotten better at doing it. We are faster and surer in our process, which is of some relief because one of the hardest things about butchering is when you accidentally cause any extra suffering. And, in our learning and with a lack of seasoned mentors to show us the way, we have stumbled in this regard. However, the thing that has continued to be consistent for me in that process is the unique emotional landscape it has provided- it’s unlike anything else I’ve ever experienced. 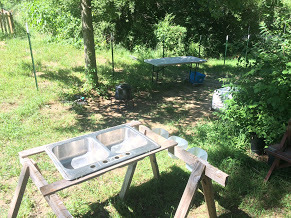 Our fairly pleasant little outdoor kitchen for the butchering process. I probably wrote about it back in the day when we first butchered our old hens out in the garage at the old house. It’s hard. It’s sad. It also feels strangely… right. The chicken being a beautiful chicken feels right. The caring for that chicken feels right. The sacrifice of that form into something different? Well, I won’t say that it doesn’t evoke some conflicting feelings or resistance in me, but it also feels right. I have yet to cross over into anything resembling indifference or trauma. I also notice that I’m much more inclined to use every last scrap of those birds. My mentality about it when I have a relationship with it (and this is also true of vegetables) is far more caring and less wasteful. But it’s interesting. Sometimes I think the most painful thing about it is that I don’t understand, and that I don’t think I can. I struggle with that sometimes, and then I release it because I must. 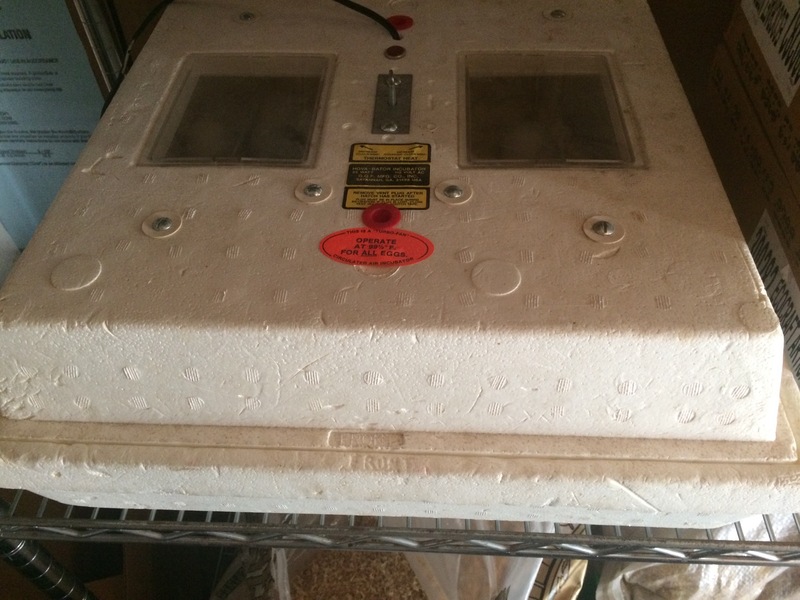 Then at the beginning of August we realized we had this old incubator gifted to us from a new friend who’d had it for years and didn’t use it. 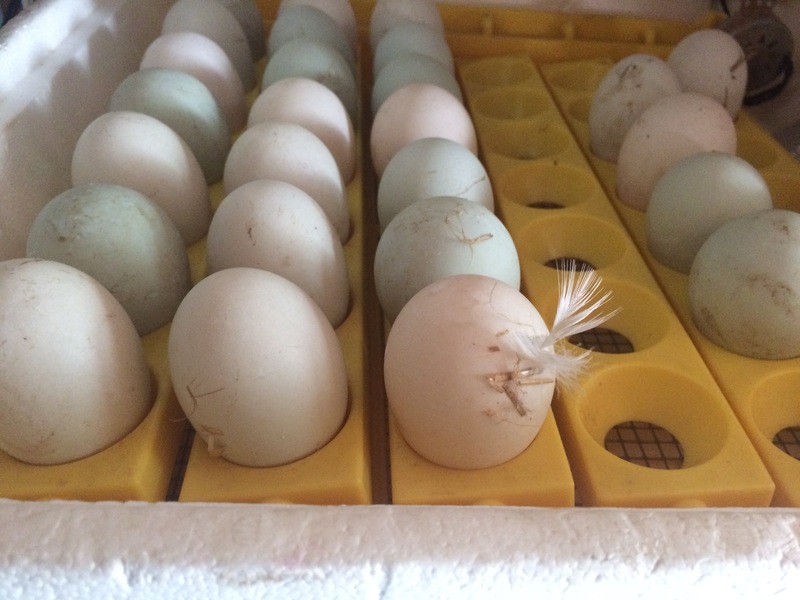 We decided to dust it off and try our hand at the incubation process, since we still really wanted a larger flock of ducks this year. We gathered eggs from our four hens for a week, and we studied books and the internet and treated everything with the utmost care. Once in the incubator, things largely took care of themselves. The technology is designed to rotate the eggs, manage the temperature, etc. It was simple! We candled them after a week (essentially you just shine a light into the egg and check for development of veins and check some other markers that indicate healthy development. It was amazing. I was awed! I mean, life’s design is really something. Almost all the eggs were fertile and we could even see little week old duck embryos dancing around within the shell. We were diligent, and everything was looking very healthy over that month. Then, the day came that we were to shift things around in the incubator, candle the eggs one last time, increase the humidity, and prepare for the hatching. 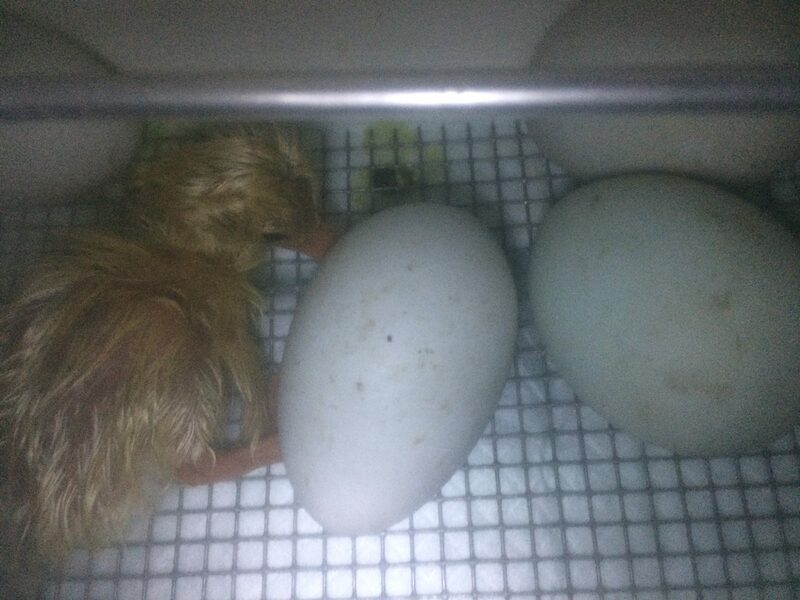 We did it right on time, since within the first few hours of “lockdown” we had a perfect little duckling hatch. According to many forums and articles, you aren’t supposed to open the incubator at all during this time. We watched with excitement as a few other eggs started to pip. We watched them work and struggle and peck away at their shells, and then, one by one, we watched them die. I started to feel pretty anxious and confused at that point. I poured over the information wondering what could have gone wrong. We ended up quickly removing the dead eggs and the one duckling to create a better environment for the remaining eggs. One more egg had pipped and a little duckling was taking a long time to get out. I got worried, and so I decided to intervene and help it along minimally. This seemed to work, and the little duckling was out of its shell soon after, having done most of the work itself. It seemed strong and healthy. No other eggs pipped after that. We put the new duckling in with the other (who had since been named “Winnie Amanda” by the kids. Duck #2 would soon become known as “Michael”). 2 days went by, and I was still holding out some hope for the other eggs, but something inside me knew they’d died. Then, on the 3rd morning after Michael had joined Winnie, we went down to the brooder to find that Michael had passed overnight. We were left with Winnie, who seemed lost in that big bathtub all alone. She’d jump at the far end, trying to get out. I didn’t quite know what to do with all of it. 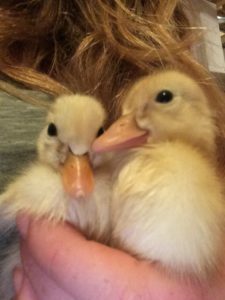 I couldn’t really imagine raising a single duckling, and she couldn’t join the big ducks until she’s several weeks old. 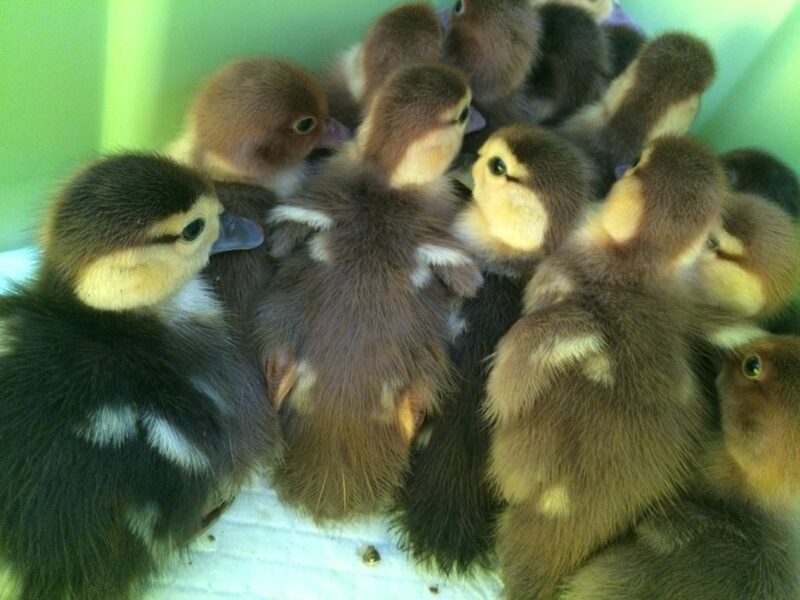 I felt like a cruel person, raising two dozen ducklings to the point of hatching only to lose all but one. I’d wanted to engage with life, not mess with it. I was discussing this conundrum with my friend Milton, lamenting the loss of ancestral knowledge and feeling the frustration of it all- of my not really knowing how or why despite all the searching. He, like any good friend, worked to comfort me and supply me with reasons that I shouldn’t beat myself up. I realized that I didn’t want him to do that, though, and I kindly told him that I actually *wanted to feel bad*. I wanted to feel the confusion of the things that had gone wrong. I wanted to sit with it. I didn’t want to blame or torture myself, I just wanted to feel it as it was. I felt called to the small suffering of that situation and my part in it. 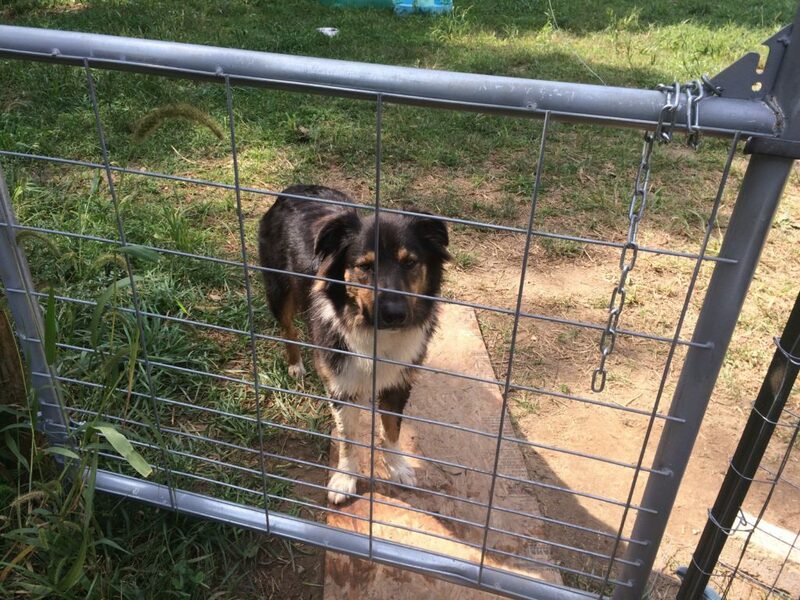 Then I listened to a thing… a thing that I just know has changed my game. I’ve started listening to this podcast called “Rewild Yourself”. It’s good stuff, well worth checking out. 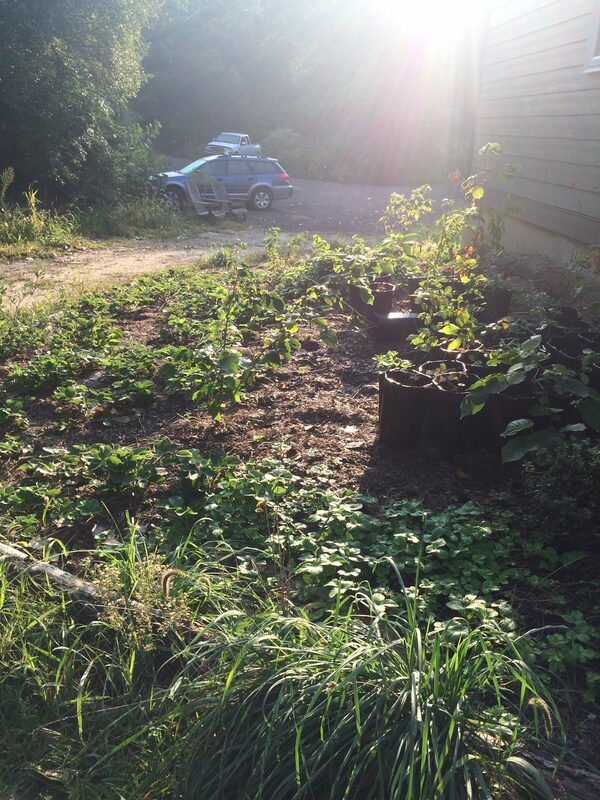 As I perused the list looking for one to listen to that morning while I worked alone in the greenhouse, I was extremely drawn to one in particular. It was called “Ancestral Amnesia and the Village Mind”. The host interviewed a man named Stephen Jenkinson (you have to skip to about the 20 min mark to get to the interview). At first the interviewee seemed a little bizarre to me. I could tell this was a teacher, someone that people come to on their own to learn from. His speech seemed to take me a little more work to hear it. You have to pay attention, like your mind doesn’t have a well-used map of what he’s saying so you’ve got to stay engaged to make sense of it. His way of delivering concepts was just kind of… different. It took a second for me to get fully absorbed. This can happen at times when I’m not fully interested or distracted, but this was kind of different, like it was something I needed to acclimate to. Once my mind was in, though? I was captivated. I’m actually not sure that I can summarize it adequately, so I really urge any of you who have the interest to listen to the interview and try to find something in it for yourself. But I think the take home for me was the idea that I feel lost and cut off from my human ancestry in many ways. It’s not just about not knowing what’s going on with a bad duck hatch, or just not being connected to my land base, or just not being able to make sense of the destruction around me, although that’s all part of it. I think it’s about a lack of spiritual and cultural belonging that we all crave but misinterpret as something that can be acquired in its absence. Go figure, in this culture we think what we don’t have can always be shopped for, but we forget that it has to be made and that the making itself has to make sense in the world. You really have to listen to the whole thing, I’ll be listening again tonight, but ultimately he made the very convincing case to me that in order to get back this belonging and to answer the cultural woes of our time, we have to fully inhabit our own poverty– we have to reckon with our own grief and emptiness and build from there. We can’t take it from another culture, we can’t awaken it out of some bought experience or visited place. Our awakening will be out of our own work and selflessness. We cannot take it. We are so growth focused that we aren’t remembering that the goal is, in and of itself, a highly selfish and unsustainable position to take. What if we worried less about growth and more about service? Less about finding some imagined ancestry and more about looking at what we’ve actually inherited? What if we remembered that we ourselves are creating an ancestry for those who come after us? Something’s got to give, literally. I often feel these clusters of connections happen, and the whole thing reminded me of that podcast I was a guest on with my friend Amy (it’s S2 E1, titled “Belonging”), where we started by talking about community but it meandered and ended up being a conversation about the paradox of what it takes to feel okay in the world- about how the dominant culture wants you to conquer, to consume, to reach the top of whatever false hierarchy was created in practically everything we do. In our own lives, however, we recognized how that sense of security and happiness and peace we seek happens more when we feel a sense of belonging- and that it comes not by being idolized or praised, but because of a precious kind of smallness and familiarity and communion within the world. It’s the peace and awe I feel when I have the rare fortune of looking up into a sky full of stars, or when I encounter a really old tree, or a raging thunderstorm, or the birth of a child. It’s sometimes scary but it’s also quieting. I crave being awed by my world. Where is this in my daily life? The landscape of civilization has robbed us of what I believe was a daily contact with this phenomenon. Which brings me to conversations with my dad. My dad and I are very close. We talk daily on the phone, and often talk about things like the cosmic significance of feeling small in the world. You know, the usual. I think this what’s-it-all-mean? thing that runs so strong in me has a genetic component. Anyway, he lives nearby and we see each other often, but he has a thing for snail mail and has taken to sending me letters recently. He’s referenced these conversations, and, although we hadn’t specifically talked about death in connection to this belonging/smallness concept before, his recent story tied all these themes together. He told me a story about getting lost in his car back in the 70s. He was out in unfamiliar country, and it was dark. He’d driven for hours and was starting to feel afraid. He was agnostic back then, but decided to pray. He felt a kind of surrendering, and soon found his way back to the highway feeling guided all the way. He started to feel pretty amazed and happy with God, and then he hit a rabbit with his car. Horrified, he shined his lights on the rabbit and got out to investigate. (At this point I feel it worth mentioning that he remembers that he was only wearing socks walking up to the rabbit, and was standing on the cold spring road without shoes on) He started feeling mad at God (they were on such a roll, after all), and then he watched the rabbit die. In his letter he describes the very same thing that I just did above, about being sad and scared and resistant and then watching the transition happen and being stunned by the distinct shift. And then he goes on to talk about entertaining the possibility that it was all actually okay. He had kind of an existential moment that reckoned with the idea that this is all truly out of his control, and therefore fine. And then he goes on to say “Honestly, I knew that I knew nothing.” He picked up the body of the rabbit and set it to the side of the road. Then he went home. 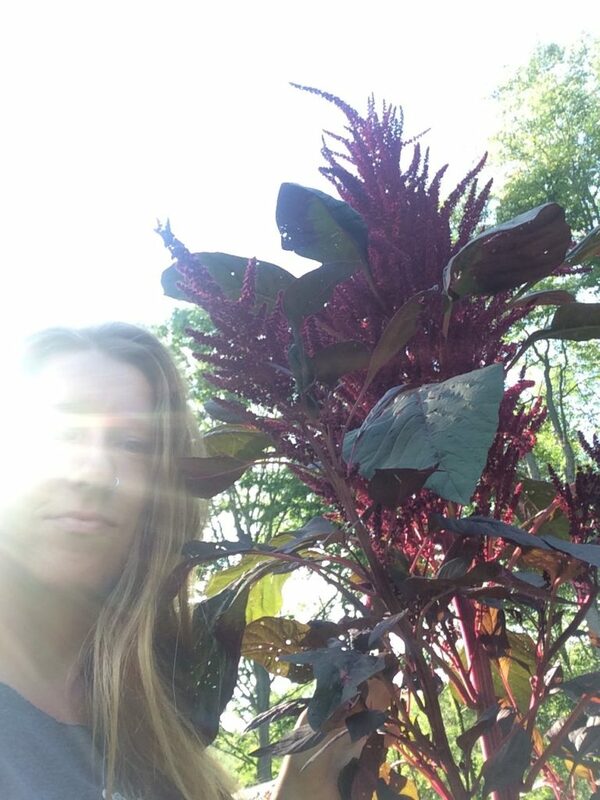 Me with a giant amaranth in the garden. And then I think about how I’m working so hard to create this living vibrant thing here, to “grow”, to inhabit this way of life headed towards health. And I suppose I’m starting to think there’s a reason that in doing this I’m finding myself face to face with death and failure all the time. It’s not just in my farm work, it’s all over the place in the work I’m doing that I think is most connective and most purposeful. I think there might be a reason that I didn’t want to feel better that day. I just think there’s something to the surrendering and going from there. We ended up finding 15 more ducklings on Craigslist, to join our little pal Winnie in the brooder. They hatched the day before she did, all from under the care of their mama duck. 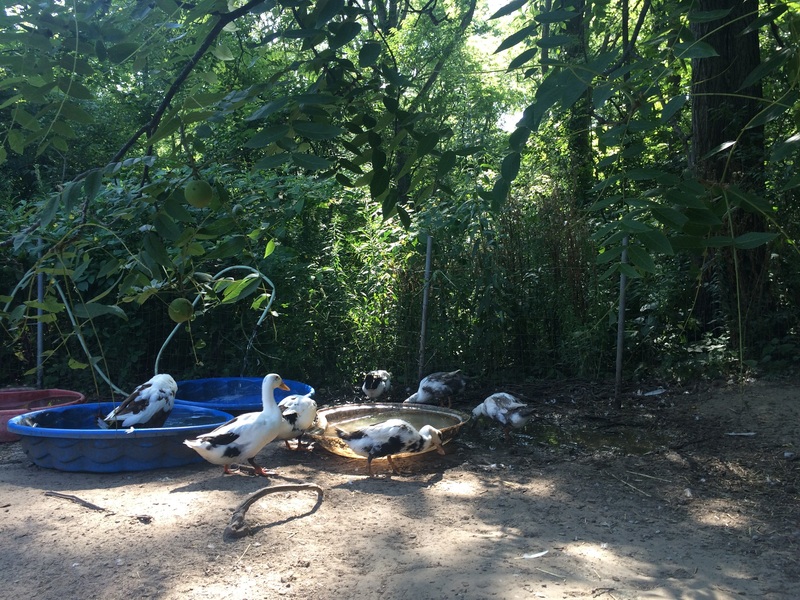 They are Muscovies, so they’ll be a different kind of experience to raise. One of them died. So now we have 15 babies total and I’m doing my best to just look at them every day and love and feed them, remembering that the closer a relationship I get to the source of these things, the less in control I actually am. And maybe the more I am set upon by longing, the more I feel I belong in the world.